He should have bought a 2016 CTS-V, it's awesome! Kevin Harlan did the play call on the nut who ran on the field during the Rams / 49ers game last night and it was brilliant! Today's edition -- a 9 year old rugby player from Australia who single-handedly destroy the opposition. The video is a must see! A glimpse of things to come!! schedule is a unc degree! 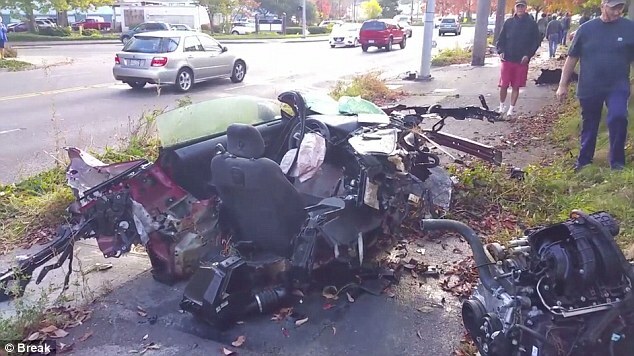 Prior to hitting a power pole, this was a Ford Mustang (Seattle. 90mph). Driver walked away uninjured! Auto safety has come a long, long, long way in the last 20 years but this person also had a ton of luck on their side. Do you think it's totaled? Where did the driver land? a US heckler in the crowd shouted that even he could make that putt..so they pulled him from the crowd and had him try. They had a $100.00 bet on it as well. "I may be in over my head..."
Ok, no Ménage à trois jokes here! I would have to be wearing brown pants. There are far easier ways to commit suicide.